Tara DiMario, left, listens to recordings of her deceased daughter, Erin Payne, with her granddaughter and Erin’s daughter, Madison. The MP3 with the recordings was given to them from StoryChain out of Dayton. WILMINGTON — A loved one’s voice lives on thanks to a little help. 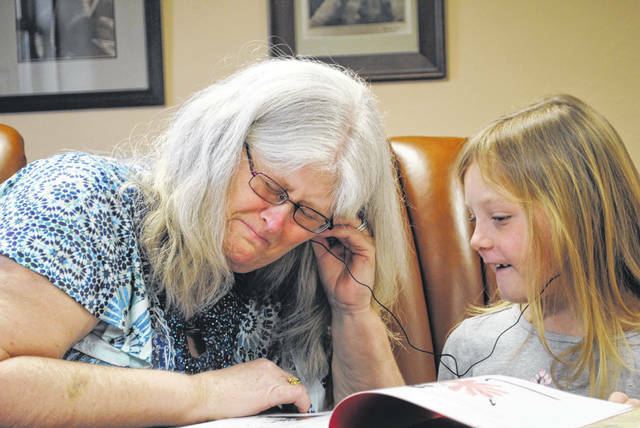 At the Wilmington Public Library on Saturday, 7-year-old Madison Payne of Blanchester was given an MP3 player containing hours of recordings from her late mother, Erin. The recordings, most of which are Erin reading her stories, were originally presented when Madison was three. Since then, the first MP3 player has worn down, so Jonathan Platt of Story Chain presented Madison with the recordings on a new MP3 along with recordings of book readings from other people. Platt, Story Chain’s Executive Director, said it was an emotional moment for many. It had been a long time since Madison — or her grandmother and Erin’s mother, Tara DiMario — had listened to their loved one’s voice. The only dry eyes were Madison’s, according to him. “Hurry, Mamaw! Let’s go home so I can read these books that momma is reading,” he recalled Madison saying. Madison was one of the first people to receive an MP3 from Story Chain back in 2015. Her mother, Erin, was the first inmate the group worked with while she was incarcerated in the Dayton Correctional Institute before she passed away suddenly the same year, shortly after being released. Platt described Story Chain as a “straight-forward project program” that works with incarcerated parents that want to read to their children. The recordings are edited and then compiled onto an MP3 player, which is then given to the child at the local library. Story Chain is a project from UpDayton, an organization that “seeks to attract and retain young talent to the region by inspiring and empowering individuals to become impactful difference makers and the next generation of civic leaders,” according to their website. At that time, they drove straight to Madison’s grandmother’s residence in Blanchester to make sure Madison got it right away. Platt said Madison, then 3, appeared confused at the recordings. When she turned 5, she wanted to listen to it and had been listening to it for the past two years. “We do everything to make sure these recording voices are the best quality that we can possibly get,” said Platt. They work with the inmates on the selection of books, and they discuss the books, and work on their delivery — and how to be silly. “There’s not a lot of opportunities to be silly in jail,” he said. There will be times where the guards, the warden, public officials, and community volunteers will get involved with it. “I think parents need to read to their children, and more importantly, I think children deserve that. The deserve to have their parents read to them,” said Platt.